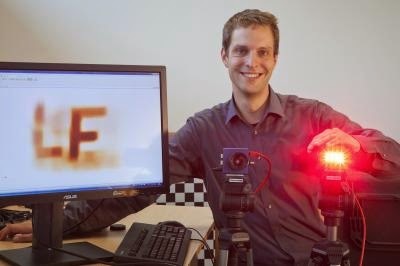 Scientists at the University of Bonn and the University of British Columbia (Vancouver, Canada) have developed a novel camera system which can see around the corner without using a mirror. Using diffusely reflected light, it reconstructs the shape of objects outside of the field of view. This is Matthias Hullin from the Institute of Computer Science II at the University of Bonn. The researchers will be reporting their results at the international Conference for Computer Vision and Pattern Recognition (CVPR) from June 24-27 in Columbus (Ohio, USA). A laser shines on the wall; a camera watches the scene. Nothing more than white ingrain wallpaper with a bright spot of light can be seen through the lens. A computer records these initially unremarkable images and as the data is processed further, little by little, the outlines of an object appear on a screen. Yet, this object is behind a partition and the camera cannot possibly have seen it – we have apparently looked around the corner. A magic trick? "No," says Prof. Dr.-Ing. Matthias B. Hullin from the Institute of Computer Science II at the University of Bonn. "This is an actual reconstruction from diffusely scattered light. Our camera, combined with a mathematical procedure, enables us to virtually transform this wall into a mirror." The laser dot on the wall is by itself a source of scattered light, which serves as the crucial source of information. Some of this light, in a roundabout way, falls back onto the wall and finally into the camera. "We are recording a kind of light echo, that is, time-resolved data, from which we can reconstruct the object," explains the Bonn computer scientist. "Part of the light has also come into contact with the unknown object and it thus brings valuable information with it about its shape and appearance." To be able to measure such echoes, a special camera system is required which Prof. Hullin has developed together with his colleagues at the University of British Columbia (Vancouver, Canada) and further refined after his return to Bonn. In contrast to conventional cameras, it records not just the direction from which the light is coming but also how long it took the light to get from the source to the camera. The technical complexity for this is comparatively low – suitable image sensors came onto the mass market long ago. They are mainly found in depth image cameras as they are used, for instance, as video game controllers or for range measurements in the automotive field. The actual challenge is to elicit the desired information from such time-of-flight measurements. Hullin compares the situation to a room which reverberates so greatly that one can no longer have a conversation with one's partner. "In principle, we are measuring nothing other than the sum of numerous light reflections which reached the camera through many different paths and which are superimposed on each other on the image sensor." This problem, known as multipath interference, has been giving engineers headaches for a long time. Traditionally, one would attempt to remove the undesired multipath scatter and only use the direct portion of the signal. Based on an advanced mathematical model, Hullin and his colleagues, however, developed a method which can obtain the desired information exclusively from what would usually be considered noise rather than signal. Since multipath light also originates from objects which are not at all in the field of view, the researchers can thus make visible what is virtually invisible. "The accuracy of our method has its limits, of course," says Prof. Hullin – the results are still limited to rough outlines. However, the researchers assume that based on the rapid development of technical components and mathematical models, an even higher resolution can be achieved soon. Together with his colleagues, he will present the method at the international Conference for Computer Vision and Pattern Recognition (CVPR) from June 24 to 27 in Columbus (Ohio, USA). The new technology is received with great interest – Hullin hopes that similar approaches can be used, for example, in telecommunications, remote sensing and medical imaging.